Meat is prepared in many ways, as steaks, in stews, fondue, or as dried meat like beef jerky. It may be ground then formed into patties (as hamburgers or croquettes), loaves, or sausages, or used in loose form (as in “sloppy joe” or Bolognese sauce). Some meat is cured by smoking, which is the process of flavoring, cooking, or preserving food by exposing it to the smoke from burning or smoldering plant materials, most often wood. In Europe, alder is the traditional smoking wood, but oak is more often used now, and beech to a lesser extent. In North America, hickory, mesquite, oak, pecan, alder, maple, and fruit-tree woods are commonly used for smoking. Meat can also be cured by pickling, preserving in salt or brine. 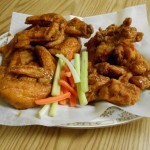 Other kinds of meat are marinated and barbecued, or simply boiled, roasted, or fried. Meat is generally eaten cooked, but there are many traditional recipes that call for raw beef, veal or fish (tartare). Steak tartare is a meat dish made from finely chopped or minced raw beef or horse meat. Meat is often spiced or seasoned, particularly with meat products such as sausages. Meat dishes are usually described by their source (animal and part of body) and method of preparation (e.g., a beef rib roast). 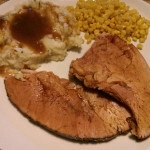 Hope you enjoy the following Meat recipes. 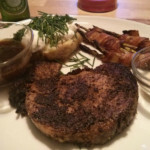 Blackened Ribeye is made by using the Blackening cooking technique. 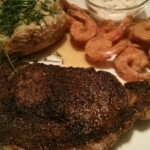 Take a good sized Ribeye, dip it in melted butter, dredge it in a mixture of herbs and spices and then cook it in a very hot cast-iron skillet. Serve it with your favorite sides and enjoy! Blackened Prime Rib is made by using the Blackening cooking technique. Slice a generous serving of previously roasted Prime Rib, dip it in melted butter, dredge it in a mixture of herbs and spices and then cook it in a very hot cast-iron skillet. 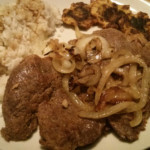 To make Bistec de Palomilla (Cuban Palomilla Steak), pick a good cut of meat, tenderize it, marinate it and fry it in some olive oil, splashed with some Vino Seco towards the end. A definite staple in Cuban cuisine, usually served with some sauteed onions, white rice, platanos and buttered Cuban bread. 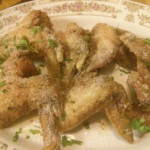 Garlic Parmesan Chicken Wings are a great alternative, especially for those people that do not like spicy food. Try them once and you will fall in love! 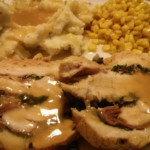 Roasted Spinach & Prosciutto Turkey Roulade is a great alternative to cooking a whole turkey at Thanksgiving or for your special event. 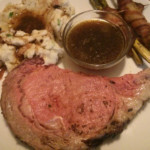 This Mojo Prime Rib recipe is a Cuban twist on the traditional ways of cooking this fabulous dish. Choose a good cut of meat, slather it in Mojo, roast it slowly and enjoy. Arroz con Pollo (Yellow Rice and Chicken) is a traditional dish of Spain and Latin America, closely related to paella. 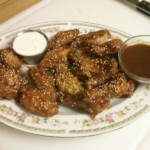 This recipe is based on a recipe handed down by my Abuela Mima and brings back memories of all the delicious flavors that were commonplace in her kitchen. 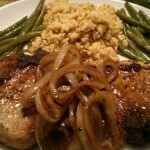 Lemon Garlic and Onion Pork Chops are one of our favorite recipes and one that we have been making practically forever. 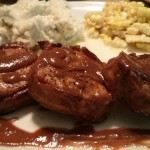 Simple, quick, great-tasting pork chops that we seem to make at least a couple times a month and everyone seems to love. 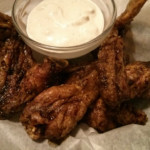 They go well with all kinds of sides and can be made any day of the week. Ropa Vieja (Cuban Shredded Beef Stew) is a very popular Cuban meat stew that is traditionally served with white rice. Many say the dish originated in the Canary Islands (where one of my Abuelas was from) and literally means “old clothes”. 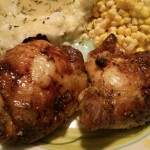 Pollo Asado (Mojo Baked Chicken) is great with mashed potatoes and corn, but you can also serve it with the more conventional sides – white or yellow rice. Easy to make and can definitely be a great weekday meal. Puerco Salamanca (Pork Tenderloin and Potatoes Tapa) is a delicious tapa featuring pork tenderloin, onions, olives, red peppers, garlic and potatoes. 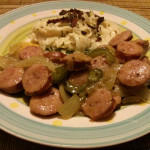 Kielbasa Sausage with Peppers and Onions is very easy to prepare and makes a great weekday meal. Serve with your favorite sides and crusty bread. 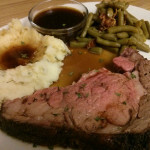 Herb-Crusted Prime Rib is a fabulous main dish for just about any occasion and much easier than many think it is. Choose a good cut of meat, prepare it properly, roast it slowly and you too can enjoy this great meal at home. This Flavor-Injected Baked Ham recipe is sweet with a little hint of spice. It is a great way to serve a delicious & juicy ham any time of the year. This Cuban-style Picadillo recipe is a traditional Cuban dish featuring ground beef, raisins, capers, and olives simmered in tomato sauce and wine. Delicioso!